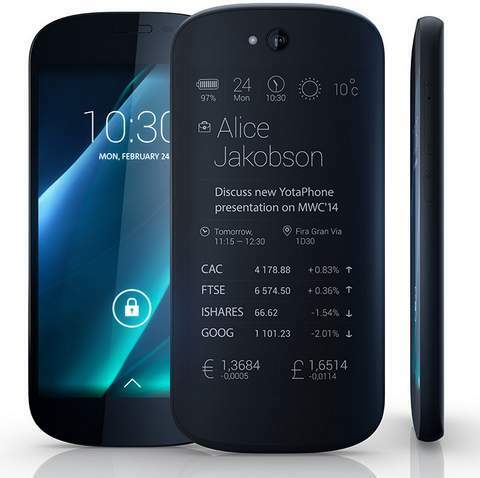 Yota launched there first Dual Screen phone last year, the company recently showcased there next gen Yotaphone at MWC. The company has made to of improvements in the new Yota smartphone, not on software but also on design. The design of the handset is much premium then the first generation Yota-phone. The handset comes with Dual Screens, a 5inch Full HD Amoled primary display and 4.7 inch qHD resolution EPD secondary display. The phone now runs on Android 4.4 Kitkat and draws the strength from 2.3 GHz Qualcomm Snapdragon 800 processor. It packs with 8-megapixel rear shooter and 2-megapixel front shooter. The handset weighs 140 grams and is 8.9mm thick. To make the Yota Phone alive there is 2550 mAh battery, which can be charged with wireless charger. The company claims that the new Yota Phone can offer up to 50 hours of battery life when reading on always on display. The company has integrated bunch of new features and apps to make the device approachable and secure with anti theft protection feature. The handset offers standard connectivity options like, 4G LTE, 3G, WiFi, Bluetooth, GPS , NFC and micro USB with OTG. The device has 2 gigs of RAM and 32 gigs of Internal Storage.